Ever cursed your parents for not giving you a wonderfully thick mane of hair? Constantly getting hair envy watching celebs strut around with their gloriously long locks? Reality check! They’ve probably got hair extensions. But the good news is there are a variety of extensions that suit a range of hair types, and they come with varying levels of cost, permanency and upkeep. Here’s the lowdown on hair extensions. In simple terms, hair extensions add length and/or fullness to your natural hair via the incorporation of human or synthetic hair pieces, which are generally glued, clipped or sewn into place. They come in a range of sizes, textures and colours and they’re not cheap, so it’s best to do your research first and then talk to your professional hair stylist (that’s us!) about what option is right for you. If you’re wondering why you should use hair extensions, then you may be surprised to learn that they have a number of amazing benefits, the first being that they add length to your hair. If you’re after instantly longer hair (hello, special event), you’re growing out a short cut, or you’re one of those people whose hair just doesn’t grow fast enough, hair extensions might just be the solution. They also add volume, so once your extensions are applied, your hairdresser can give you a cut that’s at a more subtle understated length, or you can choose to keep your locks as long and luscious as you like. If you’ve been dyeing your hair for a while then you’ll be familiar with split ends, which can be tricky to remove as they tend to spread upwards from the bottom of the hair strand. Hair extensions can cleverly conceal these, meaning your hair will look glossy, shiny and super-healthy. Need a bit of a pep-up? Hair extensions can also be used to add a pop of colour, subtle highlights or they can completely change the natural colour of your hair. They can also be used to achieve the Ombre and Baylayage trends by adding darker or lighter coloured extensions through the bottom half of your hair without actually having to dye your natural hair. And of course one of the most exciting benefits of hair extensions is that they give you access to unlimited hairstyles! Down styles, up styles, braiding and trends straight from the catwalk can be achieved, giving you a stylish and unique look both day and night. Now let’s look at the types of hair extensions available, and what might suit your particular hair type. With these types of hair extensions, pieces of hair (synthetic or human) are taped or glued together on either side of your natural hair. They are semi-permanent (lasting four to eight weeks), virtually maintenance free, won’t damage your natural hair, and they are easy to both apply and remove. Best suited to fine or thin hair they need to be applied by a professional, particularly because they are prone to ‘show through’ and can be tricky to conceal. They will also need to remove them and then either re-apply them, or if they’ve not been maintained well, you’ll need to purchase another set of extensions and have them applied again. Clip-in hair extensions come in strands of different lengths with clips that are sewn to the strands. The benefits of these are that they won’t damage your hair, they are non-permanent, and there is no heat or glue involved. However, they don’t look as natural as other extensions, they are difficult to wear in an up do, and they also have a tendency to fall out. Clip-ins generally last around six months depending on how often you wear them, and they are best suited to medium density hair. 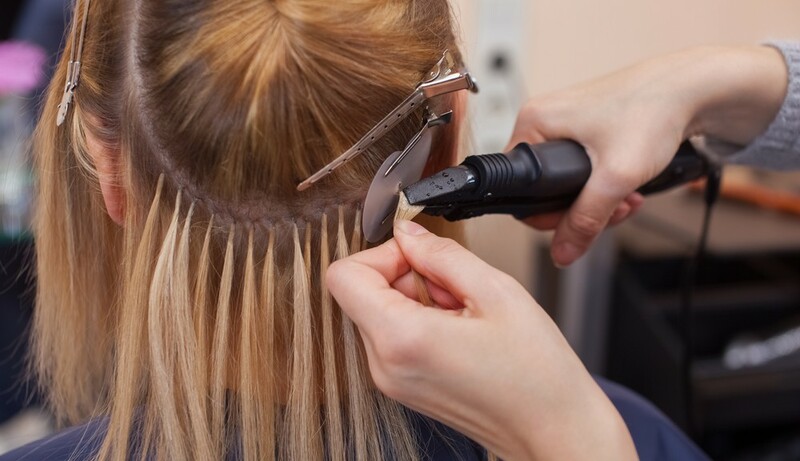 The process for micro-link hair extensions involves looping the extension through your natural hair and then clamping it using pliers and a metal bead. Suitable for medium and thick hair types, they are cost-effective, last for around 12 months and application is relatively pain free. Unfortunately, they need frequent attention as they have a tendency to slip down the hair shaft, and the metal micro link can be damaging to your hair. The application of heat (like with a blow dryer) can also cause your natural hair to break. With weave extensions, hair is braided into cornrows, and then the extensions are attached to the cornrows with a needle and thread. These are a permanent form of hair extensions that look fairly natural, and they come in a variety of colours, lengths and hair types. They are best suited to curly, coarse or thick hair as they require more hair to mask. The downsides to these types of extensions are that they can pull hair if the weft is too heavy, and if the braid is too tight it can cause added strain to your scalp resulting in hair loss. That’s why you need a hair care professional to both apply and remove these! Also known as pre-bonded hair extensions, strands of hair are bonded to your natural hair with adhesive. Application takes at least four hours and they need to be applied by your hairdresser. Best suited to medium to thick hair types, these types of extensions are easy to maintain and very discreet, particularly if they are made from human hair. They are also one of the most permanent forms of extensions and generally last around six months. There are some negatives to fusions however. Regular upkeep is required (they’ll need to be re-positioned every three to four months), and application can be quite painful as the extension is glued close to the scalp. Due to the chemicals found in the glue, they can also cause hair breakage, hair loss and scalp irritation. A relatively new type of hair extension, halos don’t require any beads, clips, glues, tapes or weaves. So how do they work? In simple terms, they involve a headband that is blended and woven into your hair, which is designed to be fitted to your head at the optimal angle. Basically, it sits underneath the top half of your hair, around your head and it’s tucked under the occipital bone (which is the bone at the base of your skull that rounds out the back part of your head). It’s virtually undetected because the hair that’s on top of it is eventually pulled over it which makes the clear wire at the front pretty much invisible. They have a long-ish life of up to 12 months with proper care, they are easy to apply and remove, and they won’t damage your hair because the halo is not attached to anything. Here’s to the new look you! Keen to give hair extensions a go? Contact us now on (07) 3844 4766 or book your appointment online!